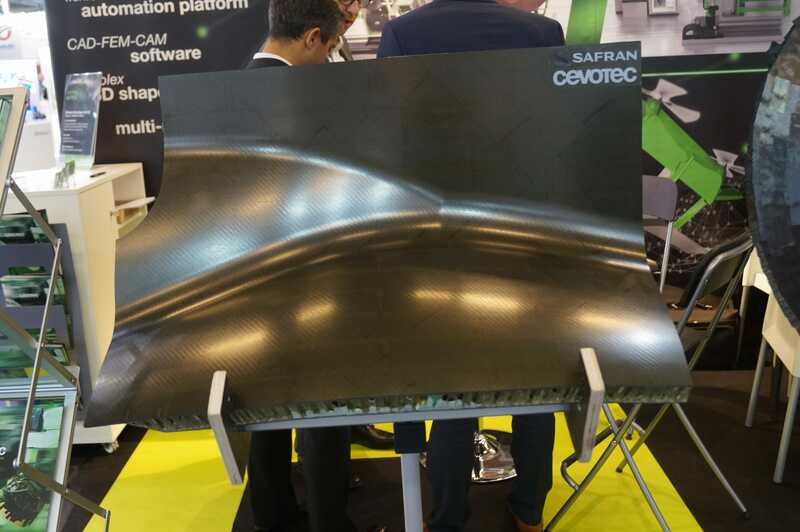 The main eyecatcher certainly was a demonstrator section of a major component of an engine nacelle structure, made in cooperation with and for SAFRAN Nacelles, demonstrating how Fiber Patch Placement handles multi-material lay-up of an aerospace sandwich component. “These components”, explains Felix Michl, CTO of Cevotec, “in aerospace industry find their main applications in winglets, stabilizers (horizontal and vertical), flight control surfaces, radar domes, aerodynamic fairings and nacelle structures.” All of them have to be lightweight yet resilient to meet the industry’s continuous strive for emissions reduction and greener aircrafts, supported by more efficient structures. In the production of such components, the geometric complexity and the multi-material mix pose a particular challenge. Production usually requires several process steps and time-consuming manual work steps. With SAMBA Multi, Cevotec offers a production system that automates the material lay-up of sandwich components in a single production system. SAMBA Multi systems feature parallel feeding units for different materials to be processed and placed precisely on 3D sandwich cores or lay-up molds. An optional linear axis and adaptive gripper sizes allow for the lay-up of also larger components.